If chefs have been incorporating blossoms within their culinary efforts for decades, why not infuse the drink menu as well? Industry professionals are finding that they can now increase their product demand by adding specialty summer drinks to their inventory segments! It’s a contemporary suggestion but targeted demographics are actually surpassing their projected expectations by 50%. The reasoning behind this lies in the appeal of adding bright shades to drinks that would otherwise be clear in appearance. Another explanation is due to the positive association that the brain makes between health, color and warmer weather elements. The psychological attraction to this concept has allowed designers to indulge in their frisky creativity therefore inventing some of Boston’s most popular new seasonal refreshers. Here is a sampling of this trendy way to fend off the summer heat waves! Nasturtiums have been held in high esteem for their added excellence within recipes craving a peppery taste. The beautiful orange, yellow, pink and red heads are also terrific in kicking up the taste of vodka once it’s had a chance to assimilate within the alcohol for a few weeks. Serve at a dinner party to amp up the summer feel or simply keep it for yourself to enjoy on a hot and steamy day! Although a name says a lot, don’t count on it before you’ve tasted this delicious drink that has the herb, lavender, to thank for its sweetness. 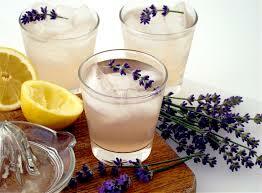 You can place stems with attached heads in a variety of liquids including soda water, ginger ale or ice water. Any variety will do but I prefer French lavender for the fresh and crisp accent it gives to my tea. These are so good I can barely stand it! 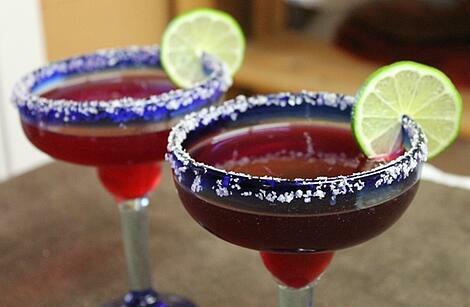 Traditional margaritas can be made playful by adding the blossoms of brightly colored hibiscus plants. Not only do they electrify a dark pink color but they also radiate the summer spirit of fun in the sun!